Draft: 2011, Philadelphia Phillies, 2nd rd. Roman Tredarian Quinn… Married Jenifer McLemore (1/27/18)… Has one daughter, Londyn Gabriella (7/8/14), and one son, Khailan Grey (2/7/19)… 2011 graduate of Port St. Joe High School (FL), where he played baseball, football and basketball… Selected as a 2011 Rawlings 2nd-Team Preseason All-American… Hobbies: Reading, playing video games and spending time with his family… Signed by: Aaron Jersild. Among all NL rookies, ranked T-3rd in SB (10) and triples (4)...Began the season with Lehigh Valley (AAA)...Was on the DL from 5/13-7/18 with a right middle finger sprain... 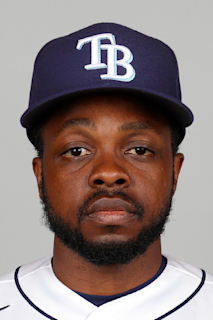 Appeared in games for Clearwater (A) and Reading (AA) before being recalled on 7/27... Made his first ML start of the season on 7/30 at BOS (RF; 1-5); it was his first start in the majors since 9/27/16 at ATL...Reached base safely in 13 straight starts, 8/16-9/14, posting a 1.095 OPS in that span...Made his first professional pitching appearance on 8/16 vs NYM (gm 1)... Slugged his first ML HR, 8/21 at WSH (Matt Grace)... Matched his career high with 3 hits, 8/29 vs WSH...On 9/14 vs MIA, hit his first career HR at Citizens Bank Park and had a career-high 3 RBI...Reached base safely in 25 of his 31 starts; had 7 starts with multiple hits... Made 31 ML starts: 26 in CF, 4 in RF and 1 in LF. Spent the season with Lehigh Valley (AAA)... Went 4-for-6, 3B, HR, 2 RBI, 4 R, 5/17 at Rochester; set his single-game professional high with 9 total bases and tied it in hits and runs... Injured his left arm on a slide into 3rd base in the 1st inning, 5/28 vs Louisville; did not play in a game for the remainder of the season... Placed on the DL, 6/9 (left elbow sprain)... Batted .307 (23-75) in his final 18 games of the season... Made 37 starts in CF, 4 in LF, 2 in RF and 1 as DH... Played in 6 games for Este in the Dominican Winter League. April 18, 2019 Philadelphia Phillies activated CF Roman Quinn from the 10-day injured list. April 10, 2019 Philadelphia Phillies sent CF Roman Quinn on a rehab assignment to Lehigh Valley IronPigs. April 4, 2019 Philadelphia Phillies sent CF Roman Quinn on a rehab assignment to Clearwater Threshers. March 28, 2019 Philadelphia Phillies placed CF Roman Quinn on the 10-day injured list retroactive to March 25, 2019. Oblique strain. July 27, 2018 Philadelphia Phillies recalled CF Roman Quinn from Lehigh Valley IronPigs. July 24, 2018 CF Roman Quinn assigned to Lehigh Valley IronPigs from Reading Fightin Phils. July 23, 2018 CF Roman Quinn assigned to Reading Fightin Phils from Clearwater Threshers. July 19, 2018 CF Roman Quinn assigned to Clearwater Threshers from Lehigh Valley IronPigs. May 15, 2018 Lehigh Valley IronPigs placed CF Roman Quinn on the 7-day disabled list retroactive to May 13, 2018. Right middle finger sprain. March 26, 2018 Philadelphia Phillies optioned CF Roman Quinn to Lehigh Valley IronPigs. October 14, 2017 OF Roman Quinn assigned to Toros del Este. October 2, 2017 Philadelphia Phillies recalled Roman Quinn from Lehigh Valley IronPigs. June 9, 2017 Lehigh Valley IronPigs placed CF Roman Quinn on the 7-day disabled list retroactive to June 8, 2017. March 27, 2017 Philadelphia Phillies optioned LF Roman Quinn to Lehigh Valley IronPigs. September 11, 2016 Philadelphia Phillies recalled Roman Quinn from Reading Fightin Phils. September 5, 2016 Reading Fightin Phils activated CF Roman Quinn from the 7-day disabled list. August 28, 2016 Reading Fightin Phils placed CF Roman Quinn on the 7-day disabled list. Concussion. August 4, 2016 Reading Fightin Phils activated CF Roman Quinn from the 7-day disabled list. July 31, 2016 OF Roman Quinn assigned to Reading Fightin Phils. July 25, 2016 Reading Fightin Phils sent OF Roman Quinn on a rehab assignment to GCL Phillies. June 16, 2016 Reading Fightin Phils placed CF Roman Quinn on the 7-day disabled list retroactive to June 15, 2016. March 14, 2016 Philadelphia Phillies optioned CF Roman Quinn to Reading Fightin Phils. November 20, 2015 Philadelphia Phillies selected the contract of Roman Quinn from Reading Fightin Phils. October 15, 2015 OF Roman Quinn assigned to Tigres del Licey. September 21, 2015 Reading Fightin Phils activated CF Roman Quinn from the 7-day disabled list. June 13, 2015 Reading Fightin Phils placed CF Roman Quinn on the 7-day disabled list. April 5, 2015 CF Roman Quinn assigned to Reading Fightin Phils from Clearwater Threshers. May 19, 2014 CF Roman Quinn assigned to Clearwater Threshers from Lakewood BlueClaws. March 30, 2014 Lakewood BlueClaws placed SS Roman Quinn on the 7-day disabled list. September 18, 2013 Lakewood BlueClaws activated SS Roman Quinn from the 7-day disabled list. June 26, 2013 Lakewood BlueClaws placed SS Roman Quinn on the 7-day disabled list. Fractured left wrist. March 30, 2013 SS Roman Quinn assigned to Lakewood BlueClaws from Williamsport Crosscutters. June 18, 2012 Roman Quinn assigned to Williamsport Crosscutters. August 15, 2011 Philadelphia Phillies signed SS Roman Quinn.